So far, I’ve hiked the Appalachian Trail, the Pacific Crest Trail, The Long Trail (Vermont), and some of the Continental Divide Trail. 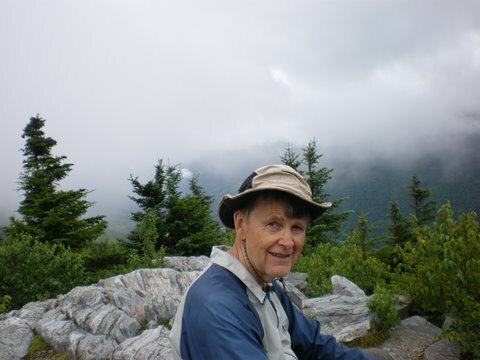 I developed an abiding interest in hiking over 30 years ago when I began climbing the 4000+ foot mountains of New Hampshire; there are 48 of them. After those, I climbed the rest of the 4000 footers in New England (five in Vermont, fourteen in Maine). This year, I tackle the Adirondacks in upstate NY (46). I’m married and have three children leading busy lives of their own. Happy to say, my wonderful wife, Nancy, has stood by me all the way. Keep us posted on your Adirondack locations so we may be able to scoot over there and cross paths! I’ve never hiked a long distance before but I’m starting to plan an AT thru hike for next year. There seems to be so much to learn but I’m not sure where to start. Can you help me? You’ve done the right thing by allowing lots of time to prepare. I would start by getting two books: “How to Hike the A.T.” by Michelle Ray and “The A.T. Guide” (most recent edition) by David Miller. There are others, but these two books should give you just about everthing you need to learn and prepare–I’ve read them both. Hello Ray I am planning a thru hike on th AT and i have already bought the thru hikers companion and was wondering if i should also buy all the maps that cover the trail as well, what do think? The A.T. is well marked and if you have the companion/guide, you should be fine. That said, I bought all the maps and would do so again. At each stop, I packed only the map sections I needed; that way, each night I could review the next section I plannned to hike. I’m pretty new to the hiking world, I was in the Marine Corps infantry but that’s pretty different. I’m wanting to do a through hike of the AT or PCT after I graduate college; I’m allowing myself as much prep time as I need to prepare(probably about 8 months). For the newer hiker that may only be able to do one through hike, which do you recommend, PCT or AT? I recommend the AT first, which is what I did. It is better marked, offers more and easier places to resupply, and has more hikers during the season. The PCT is more scenic, but getting through as the snows melt in the Sierras, but leaving not too late at the start so that you don’t boil in the desert fringe, can be tricky. Also there is more to read/study about thru-hiking the AT. Good luck.